The "McWane Way" Today - What Do the Workers Say? Five years ago, when a New York Times reporter asked a McWane lawyer for an interview with company executives, he was told, "Son, the McWanes haven't talked in a hundred years, and they aren't about to start now." Today, however, it's a different story. While Phillip McWane himself still refuses to meet or talk with FRONTLINE, McWane's approach to media relations has changed dramatically. When FRONTLINE contacted McWane in 2007 for an update to its original reporting, McWane President Ruffner Page responded almost immediately. In a letter (PDF file), Mr. Page wrote, "I welcome the opportunity to share information and talk about the dramatic transformation of our Company since the original publication and broadcast." Over the course of the next three months, McWane sent additional letters, as well as binders with thousands of pages of supporting materials, as evidence of their turnaround. McWane also hired a "strategic media adviser," former investigative reporter Gregory Vistica, who now makes a living by advising corporations and wealthy individuals on press strategy. Nearly all of our phone conversations and email communications were then channeled through Mr. Vistica, and occasionally McWane General Counsel James Proctor, who has been with the company since 1995. While McWane provided thorough written responses to most of FRONTLINE's questions, certain issues were off the table. For instance, the company would not comment on any of their criminal cases, citing ongoing litigation and appeals. Nor would McWane entertain the idea of FRONTLINE meeting with or interviewing Phillip McWane, the company's chairman. As for meeting or an interview with Ruffner Page, McWane's president, we were told that it was "a possibility." Mr. Page initially agreed to a private dinner in Birmingham, but everything he said was to be "off-the-record," although he later allowed FRONTLINE to put "on the record" some portions of this conversation. In the end, Mr. Page granted FRONTLINE's request to go on camera, but he insisted that no questions be asked. Mr. Page agreed only to read a prepared statement and to be filmed walking through a McWane plant, their AB&I Foundry in Oakland, Calif.
At a McWane sentencing hearing in December 2005 (for convictions for charges that were subsequently reversed on appeal) Mr. Page told the court that 70 percent of the senior managers of the company and its plants had been replaced during his first year as president of McWane, 1999 to 2000. He made similar claims in his on-camera statement. However, the public record and our own reporting indicates that many of the managers and vice presidents who were indicted were in managerial roles when Mr. Page took over and stayed in similar roles until the federal indictments were returned. We asked McWane for a clarification. At first they reported that nine managers were removed, retired or terminated. Then they increased that number to 20, but did not provide names or other details. While FRONTLINE was unsuccessful in speaking to Phillip McWane, we obtained a transcript of a statement he made at the same 2005 criminal sentencing hearing at which Mr. Page spoke. 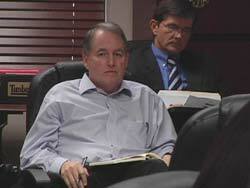 Read both Phillip McWane's and Ruffner Page's comments at this hearing here. Overall, while McWane has argued that the original stories were "one-sided" and "inaccurate," they acknowledge that The Times and FRONTLINE "accelerated the process" of change at the company. The increased scrutiny of the company by worker safety and environmental authorities, Mr. Page says, forces them to live up to a higher standard which he says he welcomes as the company tries to become the industry leader. The following are McWane President Ruffner Page's on-the-record responses to questions that were posed in off-camera discussions with FRONTLINE. The responses were provided by public relations consultant Gregory Vistica via email on Jan. 10, 2008. FRONTLINE's questions were edited for clarity. The company's responses have been arranged by topic but otherwise have not been edited. QUESTION: What was the reaction of McWane President Ruffner Page -- and that of the corporation as a whole -- to the original FRONTLINE/New York Times stories published and broadcast in January 2003? RESPONSE: Of course we were disappointed with the coverage, and are troubled by the inaccurate impression it created of our Company. While several of our plants had experienced problems, all resulting from different causes unique to each, by the time of the 2003 broadcast we were well down the road toward correcting them. Also, the broadcast greatly overstated them and also created the misleading impression that all of our operations were experiencing problems, when in fact* most of them were and are well run, well managed, safe and compliant. … We did not have a lot of experience with the press, especially the national press. The McWane family has always been a very quiet, private family as has their company. Even their millions of dollars in philanthropy usually were given anonymously. During the summer of 2002 we began to hear about reporters interviewing people about our company, and that some of the people involved in the reporting appeared to be interested only in the negative. For example, in June of 2002 one person said that a reporter told him that the NYT/Frontline intended to make McWane into the "Enron of private industry". Another former personnel director told us that she told a reporter many positive things about the company but that the reporter was not interested and only wanted to get confirmation of negative rumors. That reporter also referred to the several other people who had said good things about the company as "flakes". Several months later we were contacted by Mr. Bergman and Mr. Barstow and asked to give an on camera interview, but when asked, they refused to tell us what questions would be asked. ** As a result, we were suspicious about the reporters' motives and concluded that they did not intend to run a fair story and only wanted to ambush us on camera with surprise questions, not for the purpose of understanding the truth, but for the purpose of obtaining dramatic video footage. Nevertheless, we supplied documents detailing the positive things we had done, and responded to some of the allegations we had heard. We made the decision only to communicate in writing until the reporters would tell us what they wanted to talk about, which did not occur until a few weeks before the articles ran. The articles and the documentary were a shock. * In 2007, McWane's Clow Valve Foundry in Oskaloosa, Iowa was recognized as an OSHA Voluntary Protection Program (VPP) Merit site. McWane says they are the first iron and brass foundry operation in the country to gain that status. OSHA's Voluntary Protection Program (VPP), according to its website, is "official recognition of the outstanding efforts of employers and employees who have achieved exemplary occupational safety and health programs." Similar status has been given to McWane's plant in Elkhart, Ind. McWane also points out that it believes that its once troubled foundries are now "industry leaders" and that once their criminal prosecutions are over they intend to apply for the VPP program. ** As a matter of policy, FRONTLINE and The New York Times do not provide specific questions to subjects prior to any interview. In this case however, ahead of a potential on-the-record interview, we submitted to McWane a detailed letter containing 154 specific issues that would be addressed in the broadcast and/or articles. QUESTION: Without the prosecutions and the multi-million dollar fines, a former prosecutor told us there would not have been the kind of turnaround that McWane says it has made. McWane consultants say it "accelerated the process." Did they? RESPONSE: We started the process of correcting the problems at those facilities long before the prosecutors interviewed their first witness. The adverse publicity from the broadcast only created pressure to make changes more quickly. QUESTION: There are those, including "whistleblowers," former employees who were injured or the families of the deceased that are still "skeptical" about McWane. Some underscored their skepticism by saying that the company continued to pay legal fees and salaries to vice presidents and plant managers after they were convicted. Why did McWane retain these employees and pay their legal fees? RESPONSE: We believe in the American constitutional principle that you are innocent until proven guilty, and that every citizen is entitled to their day in court. As you can appreciate, legal representation is a very expensive process and beyond the means of most people. All of our employees maintained their innocence, and in fact several were found innocent and others won their appeals and had their convictions overturned. Consistent with our corporate bylaws, early on in this process, and with the government's full knowledge, we agreed to pay for the defense of our employees. The employees who were found innocent at trial and those whose convictions were recently overturned on appeal likely could not have defended themselves without the company's continued assistance. As I am sure you know, Judge Kaplan from New York recently penalized the government severely for its policy of trying to force companies to stop paying the legal fees of its employees, concluding that the government's policy is a violation of the employees' constitutional rights. A copy of his opinion, that discusses the issue in some detail, is attached for your reference. Editor's note: McWane refers to a 2006 opinion written by Southern District Court of New York Judge Lewis A. Kaplan regarding consulting firm KPMG's refusal to advance or pay legal fees for employees. QUESTION: Our understanding is that McWane's OSHA and EPA problems began with the company expanding rapidly, spreading out across North America and that the company evolved into a structure that allowed its plants too much autonomy. RESPONSE: McWane always had a decentralized management structure that was intended to encourage innovation and entrepreneurship at the individual plants. That model worked well with a small company. In the 1990's, however, the company grew very rapidly, from 11 facilities in 1994 to 30 in 2000, and from 2,900 employees to 7,000. This growth created many challenges in managing all aspects of operations, including compliance activities in some locations. In the late 1990's we recognized the need to revise our management systems, and began a program of capital spending, management changes, the development of new compliance systems, a program that was well underway by 2002. QUESTION: What was going on at McWane in 2002-2003? RESPONSE: We first started to become aware of the problems in the late 90's and early 00's. Many were inherited because of the rapid expansion and decentralization of the company so that McWane in Birmingham really did not have a handle on all the problems. As we became aware of the problems, we began making capital and other expenditures and management changes to try and change things. Many of these changes were well underway by the time the stories came out. "We had initiated changes and were continuing in that direction long before 2003. As a result of your articles the process accelerated." "We are nearing the point where we can't sustain multiple indictments and be a successful company," McWane President Ruffner Page said. "No company can." This comment came in the context of the indictments in Birmingham [Ala.] and the Empire Coke soil sampling incident. We brought in the best people we could find to introduce new procedures. I began going to McWane Cast Iron after a meeting with John Henshaw. Every morning I would go and see for myself what was going on. Today, I along with others get email reports every time there is an injury or illness that leads to lost work days. I began to change the management teams at the plants as early as 2000. Almost 90 % of our senior and EHS management are either new or have been reassigned. Anyone who was unable to deal with the fact that we were going to change the way things were done especially from a health and safety and environment perspective was terminated or reassigned. We have added more than 200 people for EHS including the best people we could find to run it. Our record keeping and monitoring of health and safety as well as environmental practices strive to be the best in the business. I think they are there now. But we know that this is an ongoing process. We are dedicated to improving our relationship with OSHA. Because of all of the negative publicity we know that we are held to a higher standard when we are inspected, which results in more citations and higher penalties than others might receive for the same issues. However, we welcome that heightened scrutiny. We hold ourselves to higher standards than what is acceptable in the industry, and want to be the best. When the regulators reinforce that effort by being harder on us they only help us get better. If you think OSHA is tough, you ought to meet Barb Wisniewski, our Health and Safety VP. She is as tough as they get and she has our full support. Our company makes products that are vital to our country's infrastructure. We make the pipe that brings water into our homes and takes the sewage out. We make the fire hydrants for those same homes. In the process we provide well-paying, safe jobs for more than 7,000 people, including thousands of blue collar workers who can earn a comfortable middle class living even without a college education. The factory in China began as an idea because of market pressures. Competitors were importing from China and India. Labor costs are low so importing fittings in particular makes economic sense and allows us to preserve our US operations as well. We traveled first to India and saw the conditions there. It was not acceptable. We went to China where at least the conditions are not as primitive and decided to build our own plant which operates there today guided by employee health and safety protection and environmental controls similar to those in the United States. In 2006 we were awarded the "Excellent Environmental Protection Facility of 2006" from the Cangzhou city Environmental Protection Bureau. The product that we make in China is the ductile iron waterworks fitting, which has a high labor content. We initially sought protection under 421, which is available through the government for protection from China dumping actions. And even though the ITC ruled unanimously in our favor, the President declined to sign the petition. As a result, we were at such an economic disadvantage due to the low labor costs associated with China's workforce that we were either going to have to build a plant a China, outsource our operation or leave the business. And our choice was to go build our own facility where we could control the environmental health and safety practices at that facility. We did that through 2004 and 2005, developed a program we call China Plus in China, which exceeds the Chinese environmental health and safety regulations, enforce our employees there wearing protective equipment. And as result, we have a cost-competitive blend of products that we can offer our customers. See FRONTLINE's short summary on McWane and China. In response to any employee that's hurt or injured while conducting their work at our facilities, of course, we feel terrible about that. And we want our employees to go home safe every night. And we want our employees to have good working conditions while they're employed by McWane. Editor's note: The public record reveals that McWane has been cited 221 times by OSHA since our original publication and broadcast. Unlike its previous record, none of the proposed citations was for a "willful" violation, the most serious category under OSHA regulations. OSHA has asked for $1,063,450 in fines. One high fine of $68,000 occurred at Kennedy Valve in Elmira, New York for OSHA violations described in a press release as conditions that could "expose employees to the dangers of fire, lacerations, amputation, chemical burns, crushing, falls, and eye, face and hand injuries. "Read the OSHA release. In the past five years, according to McWane's accounting submitted to FRONTLINE, there have been more than 3,800 injuries at their plants around the country, but most were relatively minor. Additionally, there have been two deaths at McWane foundries. In February 2004, Timothy Blow was decapitated when he fell into a sand-sifting machine at Kennedy Valve in Elmira, New York. During a related inspection, OSHA proposed penalties of $17,000, but for violations, the company said, were not directly related to the machine that killed Mr. Blow. In January 2005, Thomas Lawlor -- an employee at Atlantic States Cast Iron in Phillipsburg, New Jersey -- was crushed to death when a pipe rolled off a platform. OSHA cited the company for violating exit standards and fined Atlantic States $7,000. Mr. Lawlor's relatives are currently suing McWane in civil court. In interviews, McWane's EHS executives and their primary OSHA consultant and auditor, Pat Tyson, argued that many of the citations reflected improved record keeping. Mr. Tyson cited a University of Michigan study that concluded that as many as 40 percent of workplace injuries go unreported. He and the others say that improved procedures and record keeping result in "a surge in the increase in injuries and illnesses" temporarily. They point out that virtually all of McWane's injury rates both here and in China are below the industry average.